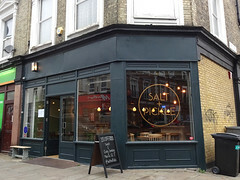 Salt & Pickle was a wine bar and restaurant in Crystal Palace. It closed for good in February 2018. Wine bar and restaurant in Crystal Palace, specialising in pickled, cured, and otherwise-preserved things. It opened in June 2017, originally under the same management as (now-closed) Good Taste deli just down the road. It's a relatively small space, despite its corner location, with much of the room taken up by a wide wooden bar with jugs of tap water and a whole ham set out on its copper top. There's seating for around 40 people, half on tall stools around the bar and a free standing island, and the rest at normal chairs and tables. Grey and white tiles cover the floor, the walls are cream and green, and stylised "bare bulb" lighting hangs from the (deliberately?) unfinished ceiling. Kake and Sarah visited on a Monday evening in September 2017. There were no other customers when we arrived around 5:30pm, but by 7pm there were eight others. Music was playing, not too loud. Pickled mushroom bruschetta (£7.35) was pretty tasty, and the walnuts sprinkled over it added a good textural contrast. English heritage tomato salad with ricotta (£4.50) photo was somewhat disappointing, though; the tomatoes weren't as flavourful as we'd hoped. Corn beef with pickles and mustard dressing (£8.35) photo was also good, though we wished there had been just a few more pickles. A "small" charcuterie board (£10) photo was actually quite generously sized, with three types of meat plus pickles, quince paste, chutney, a very decent piccalilli, melon, and grapes. Perhaps Kake's favourite dish was the gin and beetroot cured salmon with new potato salad (£9.50) photo, although the advertised pickled samphire was absent (and we forgot we'd been expecting it, so didn't ask). The salmon was very competently cured, without too much saltiness, and sliced thick enough to be substantial but not overwhelming. The potato salad had a good use of herbs, though perhaps just a touch too much mayonnaise. Everything except the cured salmon was served with white sourdough bread, which got a little tedious after a while; some variation would have been very welcome. The wine list, on the other hand, was varied and interesting, with as much as possible available by the glass; where this wasn't possible, there was an explanation of why (e.g. sparkling wines are incompatible with their bottle-resealing system). Accessibility: No steps to get in. No steps to toilet either (a single large accessible cubicle with alarm cord, low sink, and pull-down baby change). Last visited by Kake and Sarah, September 2017. Last edited 2018-03-30 09:55:44 (version 4; diff). List all versions. Page last edited 2018-03-30 09:55:44 (version 4).